Since Munich Airport is poorly connected to the Munich main railway station, it is usually most efficient to take an airport shuttle from Munich Airport to Innsbruck (door-to-door service). This transfer will take about 2-3h including waiting time at the airport. Turn left at the roundabout after about 1 km. Drive along the Kranebitter Allee direction Highway. Turn right at the intersection Kranebitter Allee and Technikerstrasse. Alternatively ou can also turn into the by-road at the intersection Kranebitter Allee and Technikerstrasse. Continue straight ahead on this by-road and you will get directly to the underground parking of the ICT Building (NOT free of charge). The Department of Computer Science is located on the second floor. Computer Labs (RR) 14 - 26 and the Seminar Room (SR) are located in the basement. 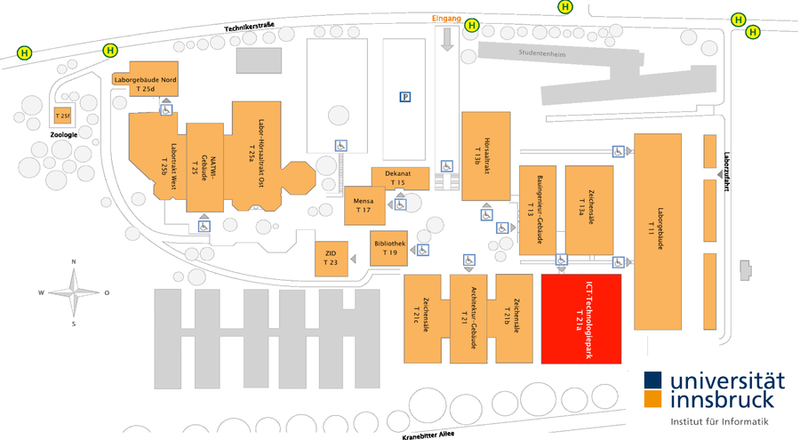 Lecture Rooms (HS) 10 and 11 and Seminar Rooms (SR) 12 and 13 are located on the ground floor. The examination department and the labs of the research group QE and IIS are located on the first floor. Lecture Halls (HS) A, C, E, and G are located on the ground floor. Lecture Halls (HS) B, D and F are located on the first floor.